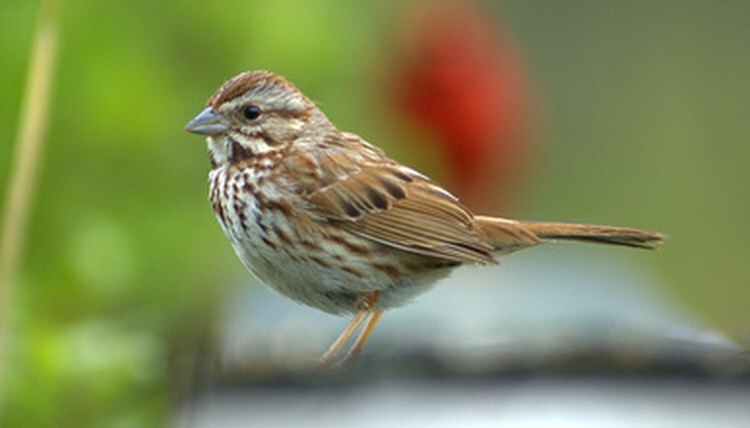 Small, active and musical, sparrows (families Passeridae and Emberizidae) are common songbirds across North America. Different species live in every possible habitat, from city streets to isolated salt marshes to scrubby chaparral country. A few—fox, white-throated, song, chipping and the ubiquitous house sparrows—will appear in backyards, city parks and suburbs. While many species prefer to build loose nests of twigs and soft plant fibers in the forks of trees or bushes, they may be tempted to nest in a handmade sparrow birdhouse. Sparrow houses resemble bluebird houses in construction, with a small boxy shape, entrance hole and swinging door on one side to allow seasonal cleaning. If you don't want to attract house sparrows, don't place a perch on the house: The house sparrow is one of the few species that use them. Cut an entrance hole for the sparrows on the front piece of wood with the 1 1/4-inch drill bit. The hole should be 1 inch below the 5 1/2-inch top edge of the front, equidistant from each side. Drill two ventilation holes with the 1/4-inch drill bit in each side piece. The holes should be positioned in the top left and right corners. Drill four ventilation holes in the floor piece with the 1/4-inch drill bit, one in each corner. Lay the floor piece on a work surface. Position the 5 1/2-inch edge of a side piece (opposite the ventilation holes) perpendicular to a 5 1/2-inch edge of the floor piece. Nail the side to the floor. Position the front piece along a 4-inch edge of the floor, flush with the side piece's edge. The floor will be slightly shorter than the front piece to allow for the other side to pivot open. Nail the front into place. Lay the roof piece flat on top of the side and front pieces. Make sure the back edge of the roof (opposite the front of the birdhouse) is flush with the back edge of the side. This creates a flat surface on which to attach the back piece in the next step. The front edge of the roof overhangs the entrance of the birdhouse. Nail the roof onto the house. Attach the back piece. The house currently has a floor, front, roof and one side. Lay the house on its front with the entrance hole facing down. Place the back piece onto it with the open side of the house flush with the edge of the back piece (you will attach a hinge here to connect the door in the next section). Nail the back piece to the house along the side, floor and roof edges. Turn the house right-side up so the back is vertical, the floor is parallel to the ground and the entrance hole faces forward. Place the second side piece against the birdhouse to create a door. The bottom edge should be flush with the underside of the floor, while the back edge of the side should be perpendicular against the back piece. Nail the 1-inch hinge to the back piece and to the side piece to create a movable door. Nail the latch to the underside of the birdhouse so the door is connected to the floor. Unhook this latch and open the side door when you wish to clean the birdhouse. Create a sparrow perch by nailing the 3-inch nail into the front of the birdhouse, about an inch below the entrance hole. Set up the sparrow house in a leafy area with plenty of shrubbery and trees nearby. Mount the house on a galvanized steel pole between 5 and 15 feet above the ground, or nail against a tree trunk in the same range of heights. Painting the house is not necessary because red cedar is a durable, weather-resistant wood. If you want a splash of color, paint only the outside of the house a light hue once it's constructed. Never paint the inside of any birdhouse or use dark paint; it will attract too much heat from the sun.